Six years ago — on November 1st, 2005 to be exact — the fledgling wine group that would soon become the Young Winos of LA held its fifth meeting ever. The topic was Syrah vs. Shiraz, and two of our most legendary and illustrious members, Jason and Andrew, made their first appearances at the Sherman Oaks home of hosts Jesse, Max and Don. Much has changed in those six years — our appearances, the economy, etc. 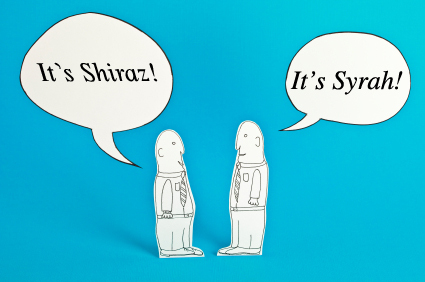 — but the question of what differentiates a Syrah from a Shiraz is one that still intrigues novice boozers to this day. Come join us in North Hollywood on Wednesday to drink our way to clarity on the issue. For Wednesday night’s meeting, please bring a bottle of Syrah or Shiraz. (As always, you can bring a $10 no-bottle donation if you don’t have time to hit up the wine shop.) After drinking everyone’s bottles, we’ll bring out two anonymous brown-bagged bottles — one Syrah, one Shiraz — and try to guess which is which based on what we’ve tasted thus far. We’ll be meeting at Andrea’s place in North Hollywood, and this week’s tasting will start at 8pm. The RSVP system functions like this: if you want in, you click on this link and tell me so (don’t forget your full name, e-mail address, and a cute message conveying to me your intentions), and I’ll send you a confirmation e-mail with the address. Once you’ve gotten your confirmation e-mail, go out and find yourself a nice bottle of Syrah or Shiraz (or bring a $10 donation, if you prefer). We’ll see you on Wednesday at 8pm!